Best lenses for Nikon D7500 DSLR camera are listed below for DX-format users. Looking for recommended lenses for your Nikon D7500? Here are the top rated Nikon D7500 lenses. The Nikon D7500 is a mid-range APS-C DSLR camera that comes with the same 20.9MP APS-C sensor as flagship D500. This sensor offers an ISO range that extends to an incredible ISO 1,640,000 equivalent. The DSLR has a burst speed of 8fps with full AF/AE, with an expanded buffer of up to 50 raw/NEF (14-bit lossless compressed) or 100 JPEG images. The camera can shoot 4K UHD (3840 × 2160/30p) video and also offers 3-axis built-in e-VR image stabilization when shooting 1080p Full HD videos. Please check our additional coverage and best memory cards articles. Also see the comparisons to brief look at the differences between other models. Nikon D7500 vs D5600 | Nikon D7500 vs Sony A6500 | Nikon D7500 vs Canon 80D | Nikon D7500 vs D500 vs D7200. 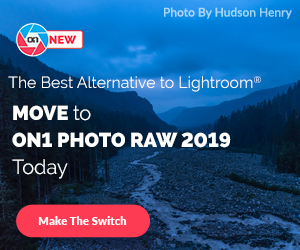 If you are a new user or in touch for this DSLR shooter. You have only need to find the best or the right lenses for Nikon D7500. We have covered best lenses for Nikon D7500 for even all shooting scenarios. Below are the top recommended and best Nikon D7500 lenses. Choose the one you need. We recommend the popular all-in-one super zoom lenses for Nikon D7500 as described below. The two lenses are the Nikon 18-300mm f/3.5-6.3G ED VR and Nikon 18-200mm f/3.5-5.6G ED VR II. Let’s take a deeper look at this optics. Nikon 18-300mm f/3.5-6.3G ED VR priced at $697 is an outstanding all-in-one telephoto zoom. It’s the best answer and surprisingly compact and lightweight for a 16.7x zoom lens. You can capture stills, videos, landscapes, interiors, portraits, wildlife means anything you want. The vibration reduction technology help keep photos sharp and videos steady. Nikon 18-200mm f/3.5-5.6G ED VR II priced at $647 is extremely popular and all-purpose lens for everything. The lens features excellent sharpness at tele and wide end and it is fully compatible with DX cameras. 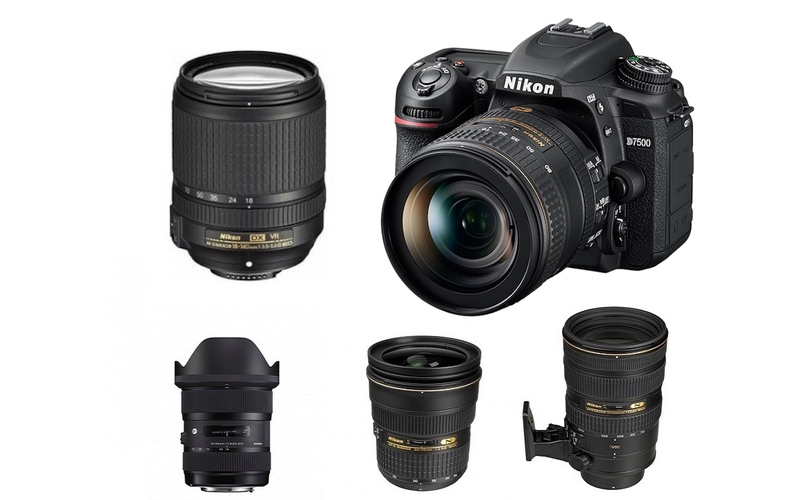 The recommended prime / portrait lenses for Nikon D7500 DSLR camera can be found below. Our choices would be the Sigma 35mm f/1.4 DG HSM Art and Nikon 50mm f/1.4G models. 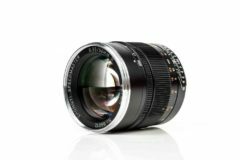 Sigma 85mm f/1.4 DG HSM Art ($1,199): Highly Recommended! An ultimate portrait lens that offers attractive booked effect and precise focus is possible to achieve to focus on the pupils of subjects eyes while blurring the eyelashes. 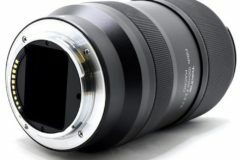 Sigma 35mm f/1.4 DG HSM Art priced at $899 is a must have optic for any camera bag. This bright prime lens gets Gold Award from the experts at DPReview. Nikon 50mm f/1.4G priced at $447 is an ideal portrait lens when used on a Nikon DX-format digital SLR. It is also a perfect lens for travel, event, environmental and general photography in a wide variety of conditions. Sigma 17-70mm f/2.8-4 DC Macro OS HSM priced at $499 is highly recommended for the perfect all-purpose travel lens choice. The standart zoom optic provides a great focal length with macro capability. It is equipped with a Hyper Sonic Motor (HSM) and an Optical Stabilizer (OS) for superior image quality. Tamron SP 24-70mm f/2.8 DI VC USD ($1,299): Excellent lens! A high quality, highly functional, high speed standard zoom lens covering the 24-70mm focal range. Tamron has minimized all types of chromatic aberration in the SP 24-70mm, making it a lens at the top of its class. It’s surprisingly compact in size for a large-aperture lens which you can carry around with you all the time. It delivers simplicity and is so user-friendly it’s sure to satisfy even the most demanding of users. Sigma 18-35mm f/1.8 DC HSM Art priced at $799 is probably the first lens you have to buy for your Nikon D7500 DSLR. It is high recommended. The lens is a new benchmark in photographic history and a must have for every camera bag, The new optic is the first wide-angle to standard zoom lens to achieve a large aperture of 1.8. The Sigma 18-35mm f/1.8 Art is ideal for landscapes, portraits, still life, snap shots, casual, and close-ups. 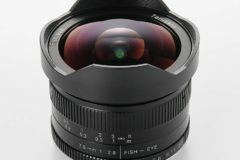 Tokina 11-16mm F/2.8 ATX Pro DX II priced at $499 is also another great lens. This would be our second recommendation in this segment. This compact lens provides more coverage with a bright constant F2.8 aperture. An internal silent focusing motor allows the lens to use autofocus on Nikon bodies that do not have an AF drive gear and motor. Fast f/2.8 constant maximum aperture is a clear advantage for low light shooting over slower models and yet possess very good sharpness levels. When we are in search of the best lenses for Nikon D7500 DSLR, we try to find the good alternatives to your needs. Here are the two recommendations! 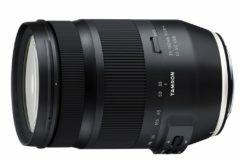 Tamron SP 70-200mm f/2.8 Di VC USD priced at $1,199. This would be an excellent choice for a telephoto zoom setup. The lens provides a fast f/2.8 maximum aperture throughout the zoom range. It is most used by customers who consider themselves to be a Semi-pro photographer among others. 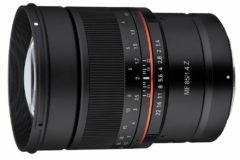 The Tamron 70-200mm f/2.8 DI USD is popular because of its Consistent output, Durable, Fast / accurate auto-focus, Nice bokeh, Rugged and Strong construction. Tamron SP 150-600mm f/5-6.3 Di VC USD priced at $1,069 will be our second choice in this category. The lens is ideally suited for sports and wildlife photography, as well as for landscapes. As you might guess we recommend this optic for needs of a longer focal length. It has a built-in tripod mount for use on tripods and monopods. On an APC-C sensor camera its focal range is equivalent to 233-930mm. Nikon 105mm f/2.8G IF-ED VR Micro priced at $897 is an amazing lens with macro shooting capabilities. It is ideal for extreme close-up and portrait work with greater working distances and AF from infinity to life-size (1:1). 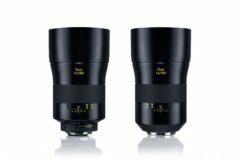 The Nikon 105mm f/2.8G IF-ED VR is the world’s first macro lens featuring Nikon’s exclusive Silent Wave Motor (SWM) and Vibration Reduction (VR). When used on cameras with an APS-C size sensor, the equivalent focal length is 157.5mm. Nikon 40mm f/2.8G Micro priced at $277 is our second choice when considered the low-price. It is ideal for shooting general close-ups, delicate flowers, detailed collectables, copy photography, portraits, landscapes and more. Nikon 40mm f/2.8G will allow users to get true 1:1 magnification for extremely close-up imaging. Sigma 150-600mm f/5-6.3 DG OS HSM Sports ($1,999): The Best Value Telephoto Zoom Lens! High action-capture performance and Dust and splash-proof construction. Designed and executed for the most demanding types of birding, wildlife and motorsports photography. Nikon 200-500mm f/5.6E ED VR ($1,397): Lightweight, compact super telephoto zoom! This compact super-telephoto zoom is ideal for bringing distant subjects closer, including birds, sports, wildlife and motorsports. Tamron SP 150-600mm f/5-6.3 Di VC USD G2 ($1,399): Excellent Lens! The SP 150-600mm G2 (Generation 2) ultra-telephoto lens with upgraded optical performance enables handheld shooting with remarkable definition: better overall optical performance and faster AF speed, VC enhancements, plus Euori1e Coal, FLEX ZOOM LOCK and tele converter. Nikon 80-400mm f/4.5-5.6G ED VR ($2,297): The ultimate medium to super-telephoto zoom lens! We have tried to list the best lenses for Nikon D7500 DSLR camera. Hope you find these information useful. Feel free to drop your comments and improve the article with new recommendations of your choices.